Building number sense skills is an integral part of early childhood math activities, and there are many hands-on ways to help kids gain exposure to number sense concepts. 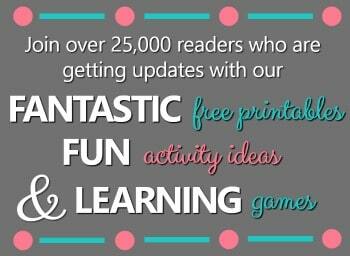 We’ve developed of series of number sense packets that help kids get valuable number sense practice all year long. They also allow teachers and parents to easily differentiate learning for multiple kids, making it much easier to meet individual needs. 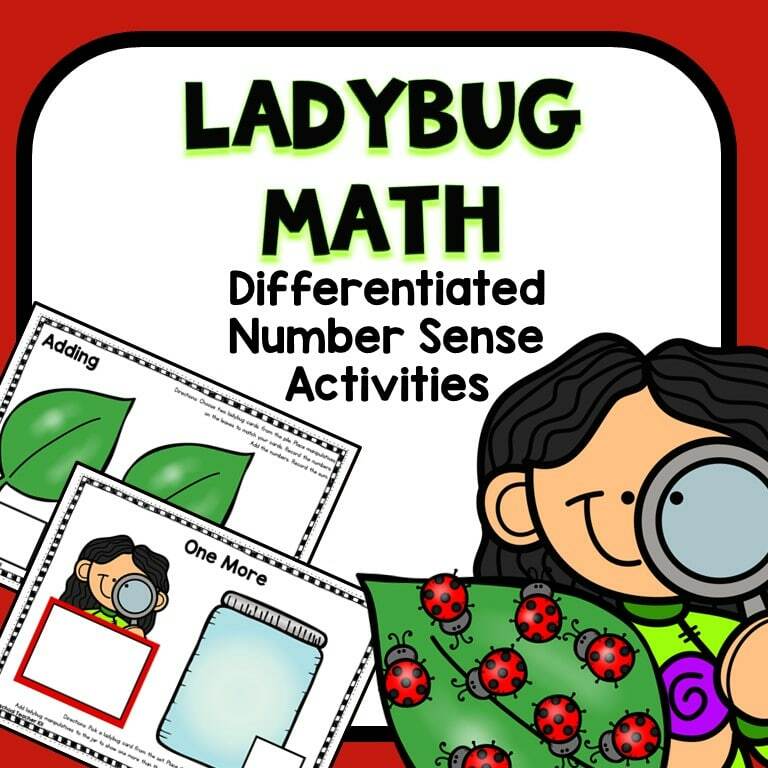 Here is a glimpse of some of the Ladybug Number Sense Math Activities from one of these sets. 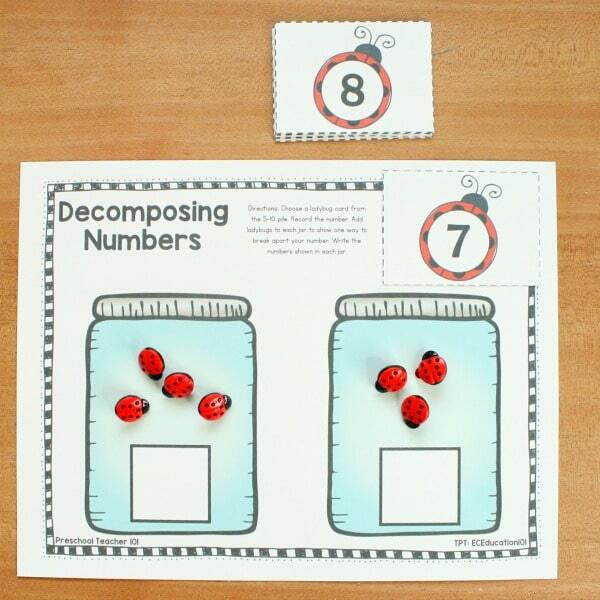 GET ALL THE LADYBUG NUMBER SENSE ACTIVITIES IN OUR PRINTABLE LADYBUG NUMBER SENSE PACK. 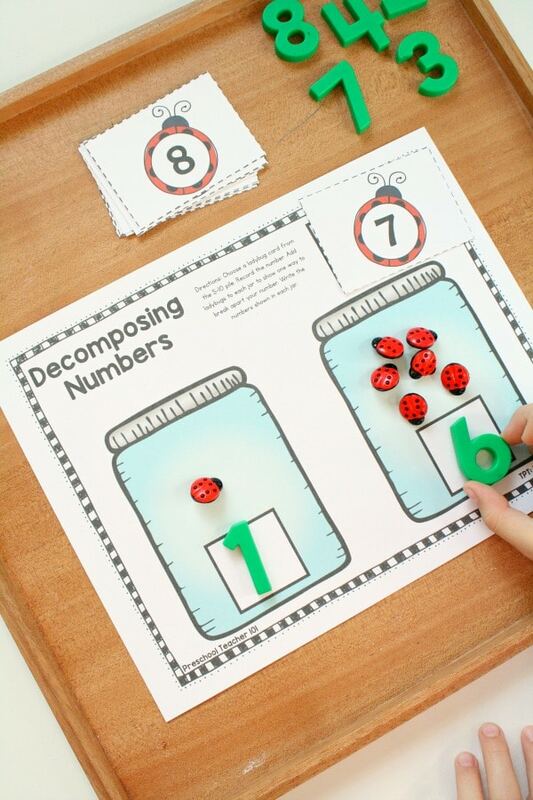 Here in this article we’re focusing on decomposing numbers and one less. Watch this quick video to see how we’re using some of these materials. In the number sense math packs there are activity mats that help students use math manipulatives to practice each math concept. 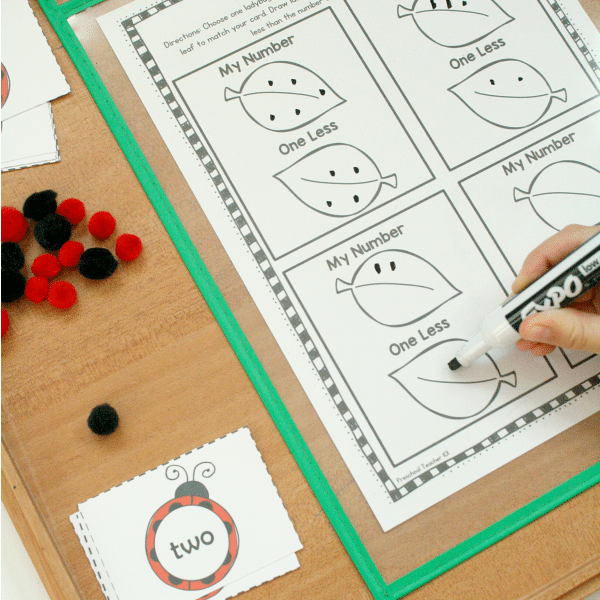 These can be used in small groups, one-on-one, and during math centers. 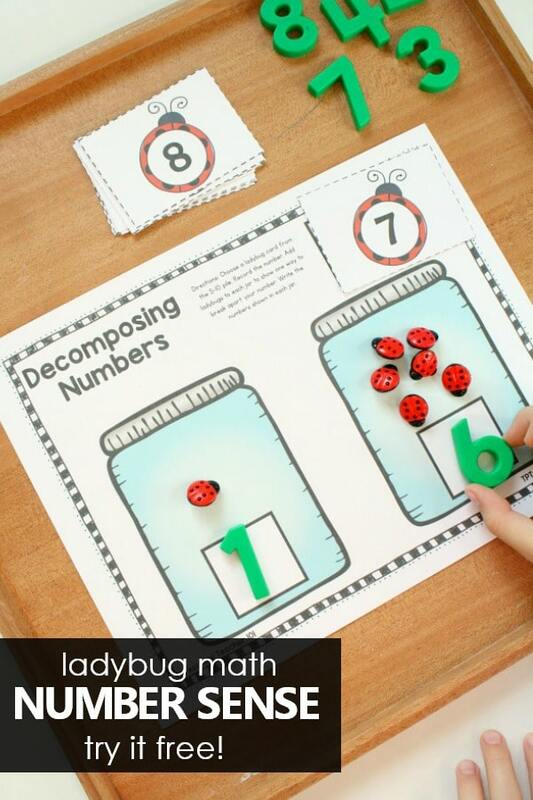 This activity mat is for helping kids practice decomposing numbers. As kids are decomposing numbers they are learning that there are multiple combinations that can be created to make the same numbers. Here 4 and 3 is shown as a way to make 7. Another child may show that 1 and 6 is a way to make 7. This provides a wonderful opportunity for kids to discuss their math thinking and show different ways to make the number. 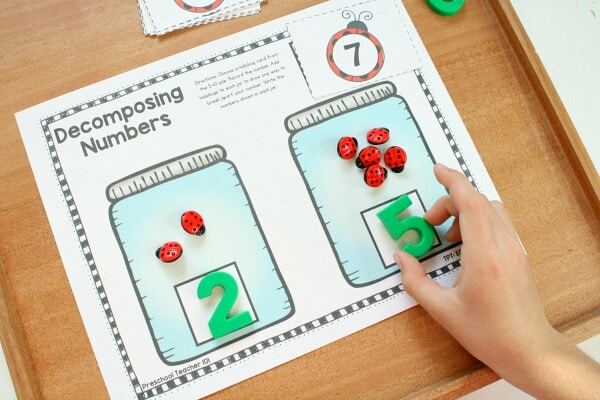 Give kids ample time to practice different ways to show the focus number. Then try a different focus number and see how kids begin to expand their thinking and find more and more combinations. 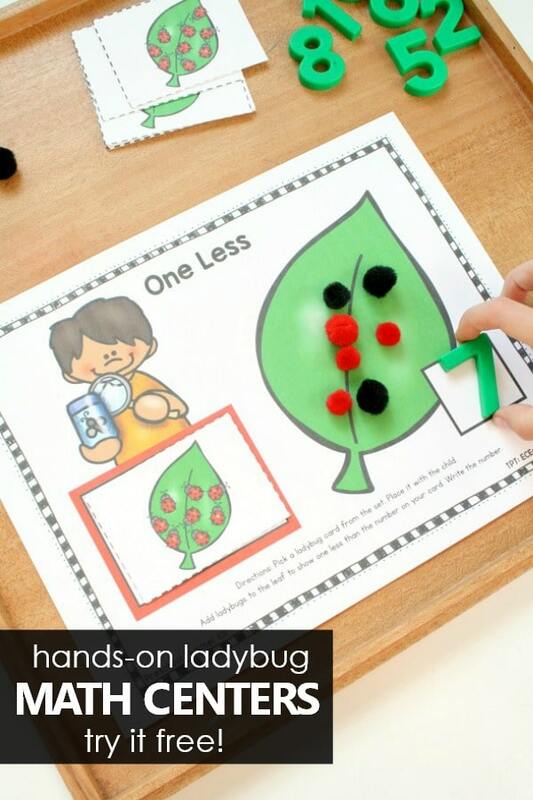 Learning about one more and one less can be a bit tricky for some kids, so practice this concept often and with concrete materials can be very beneficial. Here we’re using mini pom poms to represent ladybugs. As kids draw a card from the stack they show one less on the leaf and add the magnetic number to show one less than the amount on the card. Note that we are using the set cards here. You can also differentiate by using the number cards or the number word cards. 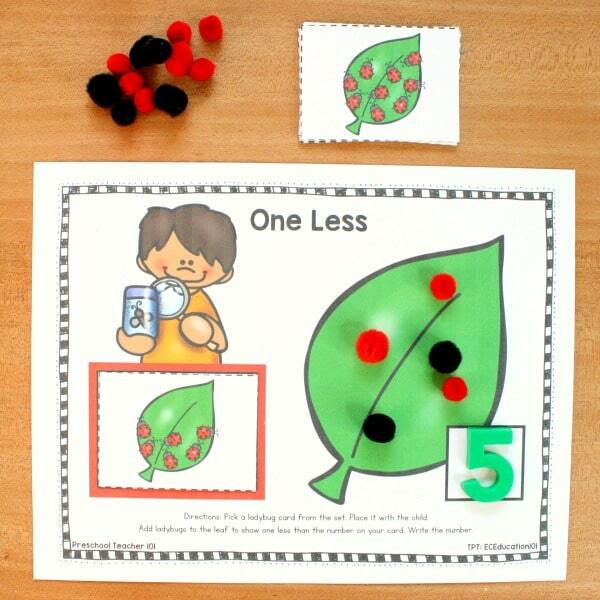 To follow up with the activity you can also have kids continue practicing by using the One Less recording sheet. 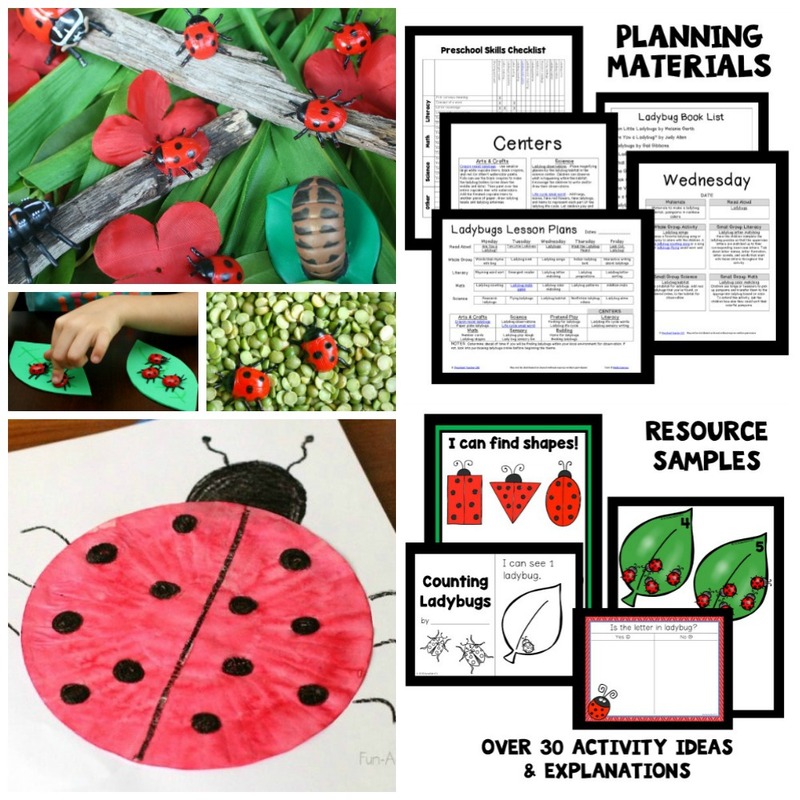 These are just two of the hands-on ways we’re using the Ladybug Number Sense Math Activities pack to practice number sense skills. There are so many more options! This 69-page set is designed to be very interactive, giving kids many opportunities to use manipulatives. 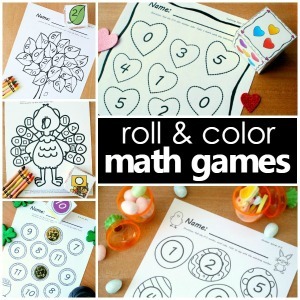 You can introduce the ideas during circle time and then use the math games during small group and center time. There are even differentiated take home packs for families to do the activities at home.